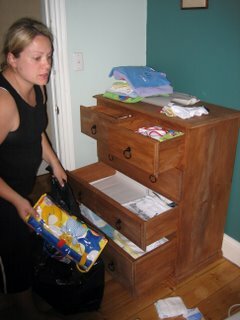 BabyBoardy Blog: "This kid has too many clothes!" We started organising a few things today, including getting out the haul of clothing we have so far (many gifts, and a few purchases) and putting them in the chest of drawers we got on eBay. There seems to be a lot of items in there, however I'm sure we'll get proven wrong with how quickly they go through them. Also... we just put them in there - we'll need to sort on size and have the 000's ready for post-birth, then the 00's etc etc. U can never have enough clothes 4 BB. Between the shitting and chucking U will likely have a few changes each by the end of the day. With regard to the "Ice Cubes" used in ante natal class, Nana and I both agree that if you times that pain by 100 you might be getting close to it. OUCH!!! Love Aunty Sue and Nana.